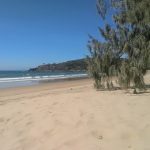 After ticking learning to surf off my bucket list, and enjoying the tranquil beachside life of Agnes Water for a few days, it was time to re-board the north-bound Greyhound bus. 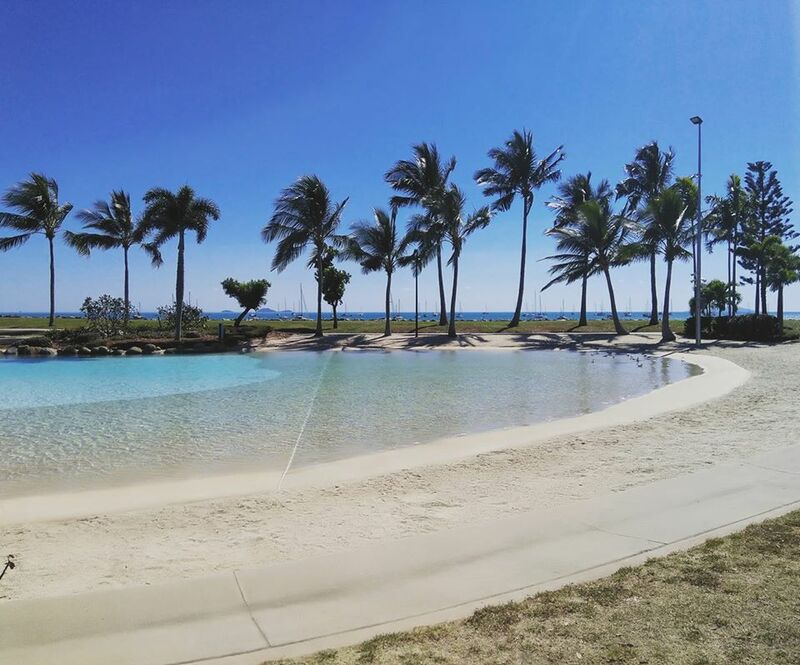 Next up was the popular backpacker town of Airlie Beach, the gateway to the Whitsunday Islands. The Whitsundays are a set of around 70 islands sitting off the coast of North Queensland, firmly in Great Barrier Reef territory. 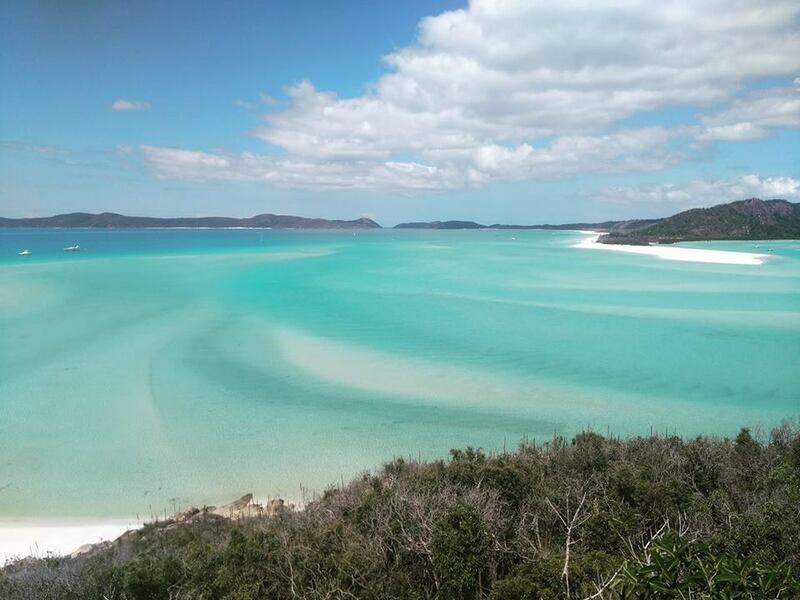 The turquoise waters and bright white sands of the islands make them what must surely be one of the most photographed spots in the country, and the Whitsundays are unanimously considered to be a must-do on the East Coast. 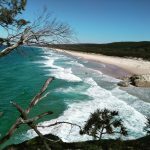 Before I even really knew much about Australia, this was one of the places that I’d heard of and knew that I had to see, so I was keen to finally get there. 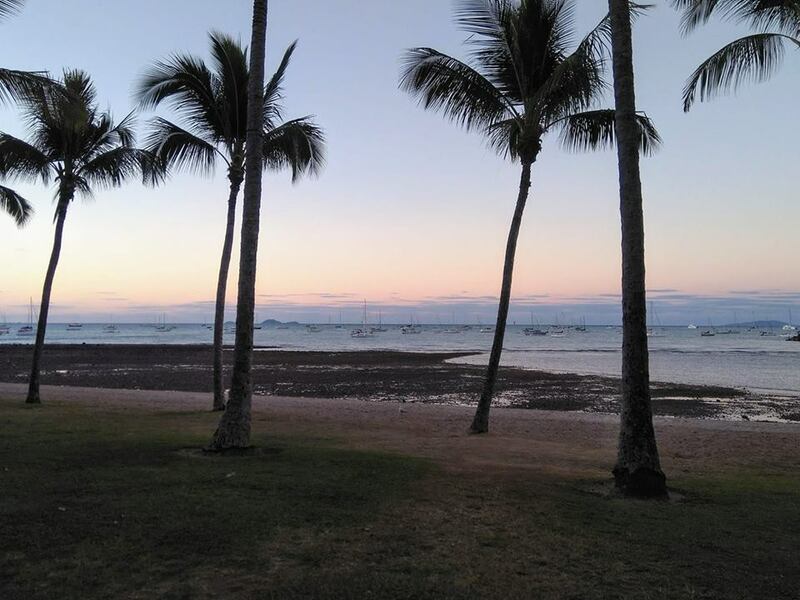 There’s quite a stretch of land to cover between Agnes Water and Airlie Beach, so I’d be braving an overnight bus again; only, at least, for nine and a half hours this time. With not many stops to rouse me from my slumber, I managed to sleep for a good chunk of those hours, waking at the breakfast stop in Mackay at 5am, then snoozing again until sunrise woke me to the views of field after field of sugarcane in the early morning haze, signalling that I was finally in tropical North Queensland. 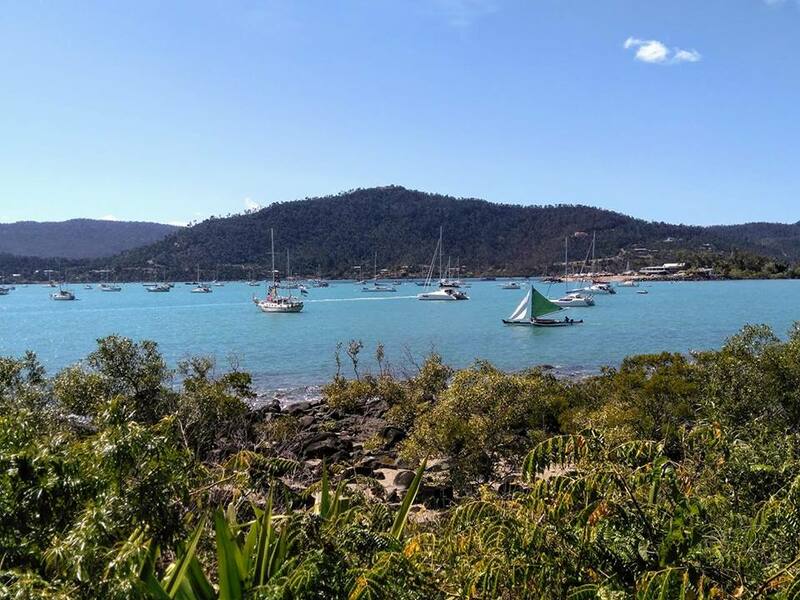 We descended down the hill into Airlie Beach with views over the marina and the little town, and shortly after 7am I was walking along the still-sleepy high street to my hostel. I’d booked into the Airlie Beach YHA, which turned out to be a particularly lovely branch of my favourite hostel chain, with comfy beds in a spacious dorm with a clean ensuite bathroom and a balcony overlooking the pool area outside. They were evidently used to arrivals first thing in the morning from the overnight buses, and happily took my luggage for me and invited me to use the kitchen to make some breakfast before heading out for a wander until my bed was ready later in the day. 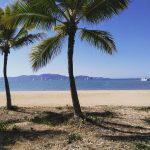 Airlie Beach is small but popular with visitors, as it’s the starting point for all of the boats going out to the Whitsundays. 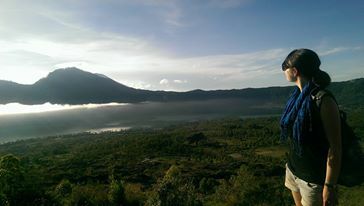 It also attracts a lot of backpackers on Working Holiday Visas who stay for a while to work in the hostels or nearby rural areas and enjoy the sunny seaside life. 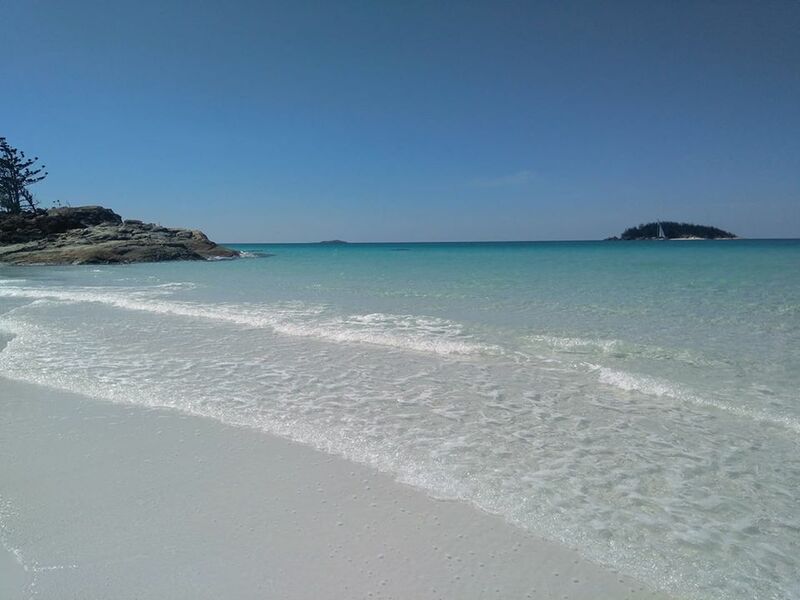 There are plenty of little shops, cafes and bars on the town’s few streets, and a lagoon for taking a dip, as the local waters aren’t really suitable for swimming due to the number of boats around, and, perhaps more importantly, the stingers which lurk in the tropical sea. The waterfront makes for a pretty walk and, reaching the end of the marinas and turning back to take in the view, I noticed that Airlie Beach has the look of a Mediterranean town, with the hills behind; something that I’d not seen anywhere else in Australia. 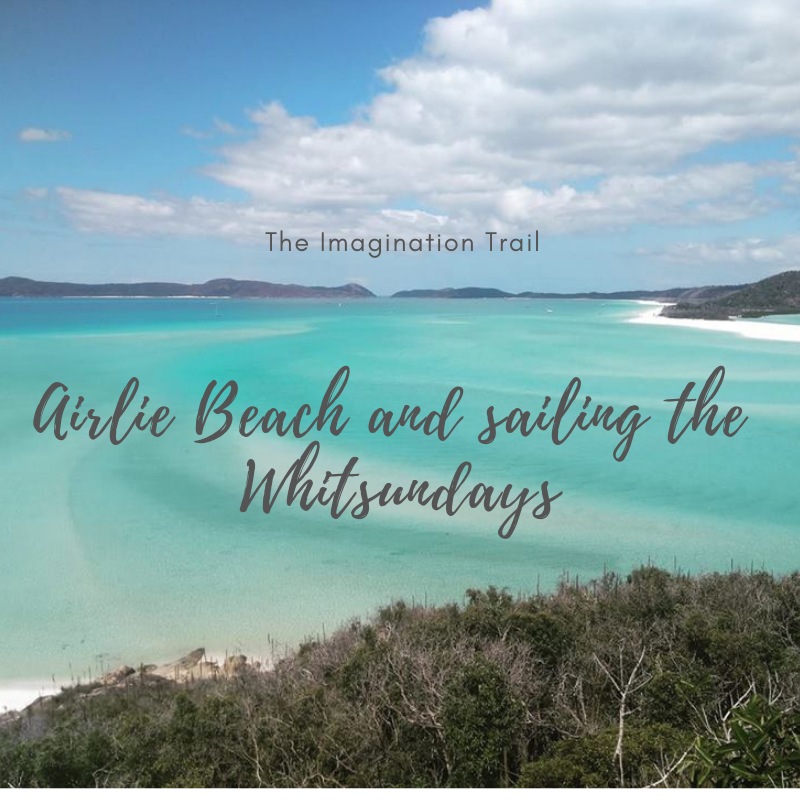 I’d come to Airlie Beach with the same aim as pretty much everyone else does; to get out there on a boat to see the famous white sands of Whitehaven Beach, to do some snorkelling on the southern fringe of the Great Barrier Reef, and enjoy some island time. There are a huge number of cruising options to choose from; many people opt for a two or three day tour, staying overnight on the boat. Whilst this sounded like fun and would have offered plenty of time for exploring the area, I wasn’t overly keen on the idea of being stuck on a boat with strangers for the night, in case they turned out to be terrible and there was nowhere to escape for a break, so I decided to take a day tour option. After some consideration I picked the CW Camira, a vivid purple (my favourite colour) catamaran which offered a special price for backpackers, all-inclusive unlimited beer, cider and wine throughout the trip, and had excellent reviews suggesting it would be a fun day out in the islands. It was an early start, as it takes a couple of hours to reach the islands, but there was coffee available on board. With it being the end of winter and not yet high season, while there were plenty of other travellers joining the cruise, the Camira was not full to capacity, so there was ample space out on the deck to find a spot to relax in the warm morning sun and observe the scenery on the way out. Having never been on a catamaran before, I enjoyed watching the crew manoeuvring the sails. As we approached the islands, the crew pointed out landmarks and shared the history of the area; as with much along the East coast, its European name came from Captain Cook’s voyage on the HMS Endeavour, during which he believed he reached the passage through the islands on the date of Whitsunday (apparently he was a little out with his calculations and it was actually the day after). Our first stop of the day was for some snorkelling. We were supplied with wetsuits – necessary for both the cooler water temperature at this time of year, and, more crucially, for protection against the stingers which are frequently encountered in the waters up north – and taken out on a dinghy to reach a spot which the crew knew had been seeing some marine life activity lately. In terms of variety, I didn’t spot quite as much as I did on my previous snorkelling trip at the Ningaloo Reef over in Western Australia, but I still saw plenty of vividly-coloured fish under the waves. 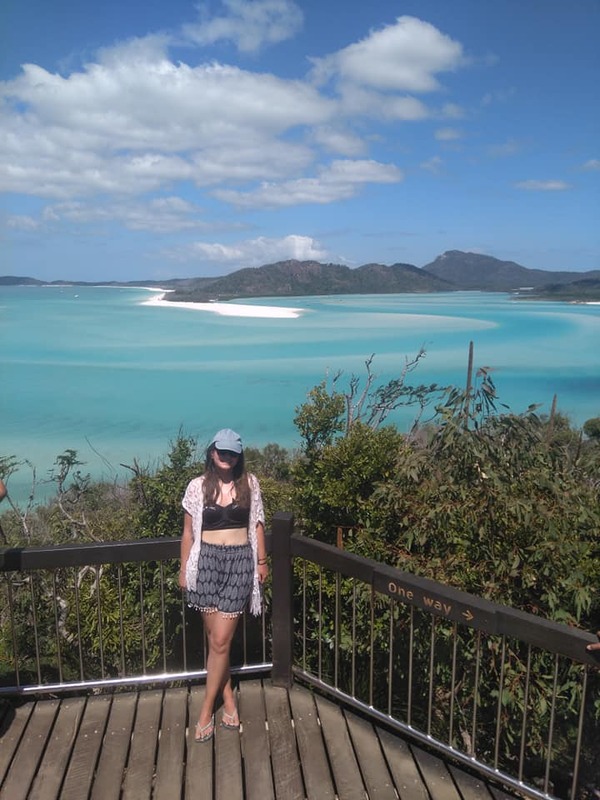 Next, we headed to the largest island, Whitsunday Island, where a short bushwalk led us to Hill Inlet Lookout where we got our first glimpse of the famous white sands of Whitehaven Beach. 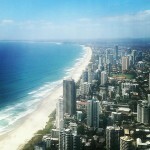 The view definitely did not disappoint; the swirl of colours in the water and the sand looked almost unreal. As one might expect, the lookout was packed with tour groups, but our crew were fantastic at finding us the best vantage points (standing on benches and the like!) for the perfect photo opportunity. 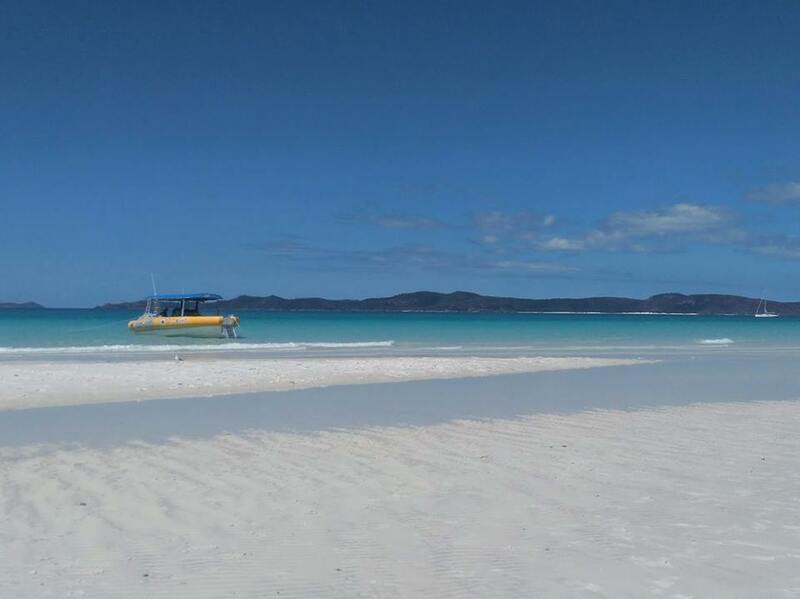 We then had an hour to ourselves to spend enjoying the beach (I’ll insert a note here about Queensland’s very strict liquor licensing laws – if you’re travelling on a licensed boat such as the Camira, you cannot take any alcohol off the boat and onto the islands with you. Please don’t try to sneak it off, as you could get your captain into a lot of trouble). 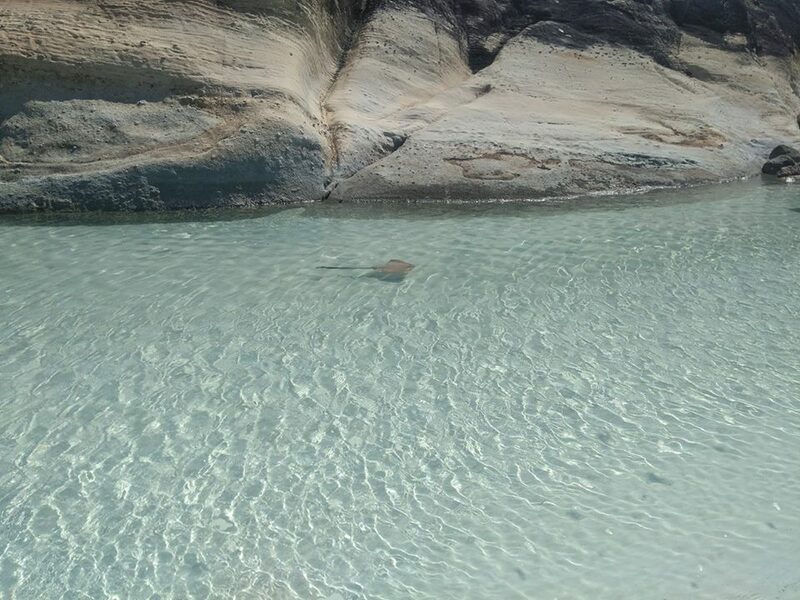 I enjoyed wandering along the sand, spotting stingrays and interesting-looking fish in the rock pools which gathered in certain inlets, and paddling in the bright blue water (if you want to swim, it’s best to bring your wetsuit along – again, stingers lurk!). A lot of the other tour groups appeared to be returning to their boats after taking in the view from the lookout, so the beach was uncrowded and made for a peaceful place to enjoy some sunbathing and the serenity of the island. 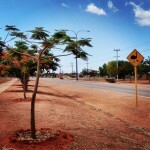 There were no shops, restaurants or hotels anywhere nearby; just the beach and the bushland behind. Back on the Camira, we were all very much ready for some lunch, and there was plenty on offer, including for us vegans. With the sun shining, the free booze flowing, and our stomachs satisfied, it was time to slowly sail our way back to Airlie Beach via the southern islands, with the crew once again pointing out sites of interest, and even managing to find us some migrating whales to watch! 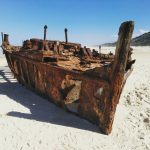 I had a brilliant trip to the Whitsundays on the Camira, but I was surprised to note that there were not many other solo travellers on the boat; most were in groups or couples, unlike on the other, land-based tours I’d already taken in Australia. This didn’t bother me – I am content in my own company and I don’t travel with the particular aim of meeting people, and, besides, the crew were very keen to chat and to help out with taking photographs anyway – but if you are someone who is particularly looking to socialise, you may wish to take a look at some of the more well-known “party” boats as an option. Of course, in high season there would be more people on the tour and, most likely, more solo-ers. Liked this post? Here’s a handy Pin for your Pinterest board!